MWC: Sony launches new flagship Xperia Z2 smartphone | What Hi-Fi? Sony has officially announced its brand new flagship smartphone, the Xperia Z2, at Mobile World Congress in Barcelona. The Sony Xperia Z2 looks to build on the success of its predecessor, the Xperia Z1, and sports a range of upgrades to the screen, audio and video performance, camera, companion apps and more. The new flagship Sony mobile was launched alongside a new top of the range tablet, the Xperia Z2 Tablet. The key Xperia Z2 specs include a 2.3GHz quad-core Qualcomm Snapdragon 801 processor, 4G LTE and a large, 3200 mAh battery. The Z2 features a 5.2in full HD Triluminos Display, 4K video recording and integrated digital noise cancellation technology, which Sony says is a world first in a mobile phone. Like the Z1, the Z2 is dustproof and waterproof – Sony claims the handset has its “highest level of waterproofing” – and has an impressive-on-paper, 20.7-megapixel camera, plus Sony’s G Lens. Sony claims the Xperia Z2 is "the world's best camera and camcorder in a waterproof smartphone" but we're most interested in that ability to shoot 4K, in our endless quest to fill the 4K content void. If creating 4K video doesn’t float your boat, owners of the Xperia Z2 can enjoy access to exclusive movie content from Sony Pictures via the pre-loaded Video Unlimited app service. There's also a month's free access to Music Unlimited available. As on the Z1, Sony borrows from its TV business for the screen, treating the Z2 to a Triluminos display with Live Colour LED, technology borrowed from the Bravia TV ranges. Sony promises richer colours than the average mobile but without saturation. There's also noise-reduction processing, Sony's X-Reality for mobile, which makes the usual boasts regarding resolution, clarity and sharpness. We have certainly been impressed with previous Sony mobile phones' video performance. The Xperia Z2 has a stereo speaker output but of more interest is the digital noise cancelling technology, which Sony claims is a world first. The tech helps reduce ambient noise technology by up to 98%. We'll look to get to grips with this in our hands-on review. Despite the hefty 5.2in screen, Sony claims the Z2 is slimmer and more comfortable in the hand thanks to its OmniBalance design. This sees the glass screen encased in a single, solid aluminium frame with smooth edges. Dust and water resistant – the Z1 could be merrily dunked in a bowl of water – it should certainly rival the likes of the Samsung Galaxy S4 Active when it comes to surviving the elements. 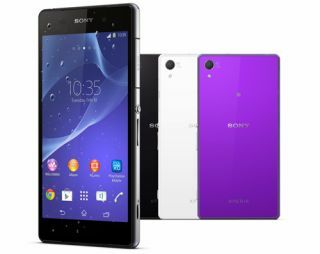 The Sony Xperia Z2, announced today at MWC 2014, is due for release in March. Also new at MWC is the Sony Xperia M2, a midrange phone, which Sony claims, naturally enough, is the slimmest and best specified in its class. The phone features a 4.8in qHD display along with a 1.2GHz quad-core Qualcomm Snapdragon 400 processor. Sony has also fitted it with 4G LTE, an 8MP camera and interestingly a dual-SIM port. Individual SIM cards can work independently and allow users to choose between SIMs before making calls or sending texts. A 2300mAh battery powers the device, and Sony’s STAMINA Mode 3.0 promises to keep it running for longer. Sony’s Entertainment Network of apps comes preinstalled, with digital downloads of three films including Captain Phillips available straight out of the box. Calum MacDougall, Director of Xperia Marketing at Sony Mobile Communications, said of the new phone, “Xperia M2 is an ultra fast smartphone that offers brilliant specs and performance, reaching new audiences with a mid-range price. The Sony Xperia M2 joins the new Xperia Z2 flagship and Xperia Z2 tablet. It will launch globally from April 2014 and come in black, white and purple finishes.